The name combines “Aulos”, the most important ancient Greek instrument – a reed pipe appearing in identical pairs – and “chrome” for chromatic and colored. The Aulochrome, a chromatic Aulos, is a new polyphonic and chromatic woodwind instrument. 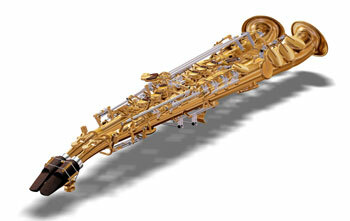 It resembles two soprano saxophone bodies and uses a revolutionary mechanism, allowing the keys of both pipes to be played either separately or together over the entire range. Thus any possible interval can be played chromatically from the lowest note of one pipe to the highest note of the other pipe. The double mouthpiece is made of two separate elements placed together. The tone chambers are different, enabling independant harmonization in the two pipes. The particular attention to the acoustics of this instrument opens up vast new possibilities to saxophonists. It allows producing differential tones (a virtual bass note resulting from the difference of the frequencies of the two notes of one interval) as well as additional tones, extending the lower register far below the deepest note determined by the length of the pipes. Also, a tiny “mistuning” of the unison generates beats; players can control the rhythm of the pulsations. All of this creates new tone effects by totally acoustic means and offers the possibility of playing contrapuntal lines. The conception and the construction of the Aulochrome are entirely the work of instrument-maker François LOUIS. With the support of : the S.P.E.S. foundation, “Brussels 2000”, Sylvain Cambreling represented by D.A.R.S.A., Orfeo Borgani and with the collaboration of Fabrizio Cassol. Fabrizio Cassol has started the study of the Aulochrome since September 10th 2001 and has worked in close collaboration with Philippe Boesmans who wrote the first piece for the Aulochrome (Fanfare III for Aulochrome and orchestra). The piece has been created in Paris, at “Maison de radio France” by the Baden-Baden and Fribourg orchestra conducted by Sylvain Cambreling on October 26th 2002 and, in Brussels, by the Monnaie orchestra conducted by Kazushi Ono on 23rd of march 2003.